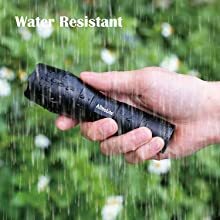 ☀ WEATHER, WATER, & SHOCK RESISTANT - Designed for rough handling, it's perfect for use in the rain, snow or emergency situations. It can be completely submerged under water for a short period. 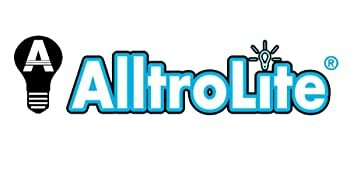 ☀ BUY NOW FROM ALLTROLITE - The only authorized reseller. Get 2 for the price of 1. Keep one in the house and one in the car. 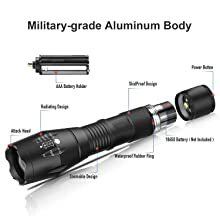 Every flashlight purchase comes with a ONE YEAR HASSLE-FREE WARRANTY and friendly customer service. 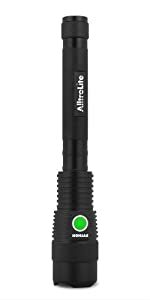 AlltroLite provide quality energy-saving lighting products for our customers with affordable deals. With the expertise in the LED technology, our product not only superior in performance but also make your lighting experience more enjoyable and comfortable anytime and anywhere. 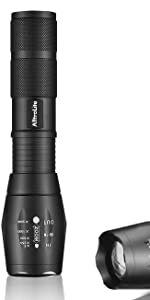 Whether you're camping, searching for that box in the attic, or taking a late night walk with the dog, the reliable AlltroLite LED 5 Mode Tactical Grade Flashlight is a good companion. 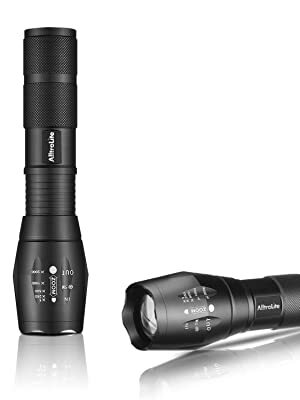 Durable and easy to handle, it is an ideal flashlight for use around the house or in an emergency. Keep one in your survival kit and one in the car for security and peace of mind. - Features: ●With a long range of 600 feet,ideal for outdoor activities like camping, hiking, boating, fishing. ●Made of high quality 6061T aluminum alloy, Which is sturdy and conducive to radiating. ● High power LED, with a lifespan of up to 100,000 hours or more, no need to consider replacing the cap for the whole life. ●Soft-touch tail cap switch allows for on/off mode and switching between 5 light modes. 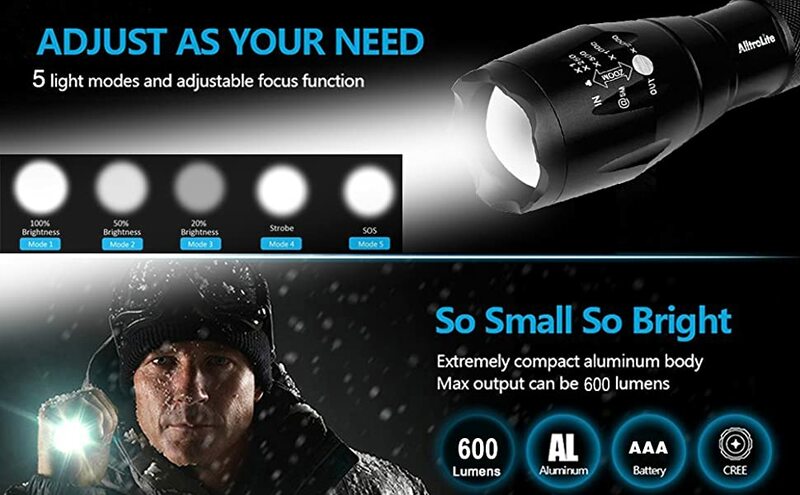 - Specification: ●Material: 6061T aluminum alloy ●Color: Black ●Weight : 190g ●LED Type: XML-T6 LED ●Luminous Flux: 600-1200 lumen ●LED Lifespan: 100,000 hours ●Range: 600 feet ●5 switch Mode: 3 Brightness Levels and 2 Security Design Modes ●Powered Source : Support 1PCS 18650 battery (not included) / 3pcs AAA battery(included). 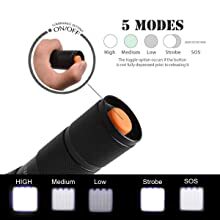 - Instructions for use: ●A deep click of the orange button turn the light ON/OFF,a light touch on the button switches between 5 modes. 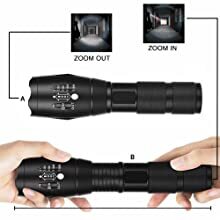 ●Hold the flashlight handle with one hand, and pull the lamp head with the other to slide and zoom. - Notes: ● The 3x AAA batteries included each Taclight ● Please do not put it into water directly though it works well in heavy rain. ● Please take out the battery if not using it for a long time and put in a cool and dry place to save. ● Do not shine directly into your eyes in case of any possible harm result by the intense light.